Bicycling, invented in Mannheim 200 years ago, is as natural to German families as eating apple strudel and reading Grimms’ Fairytales, making a Tour de Southwest Germany a fun, eco-friendly adventure with teens.. Ruins of Heidelberg Castle can be seen from the town square. 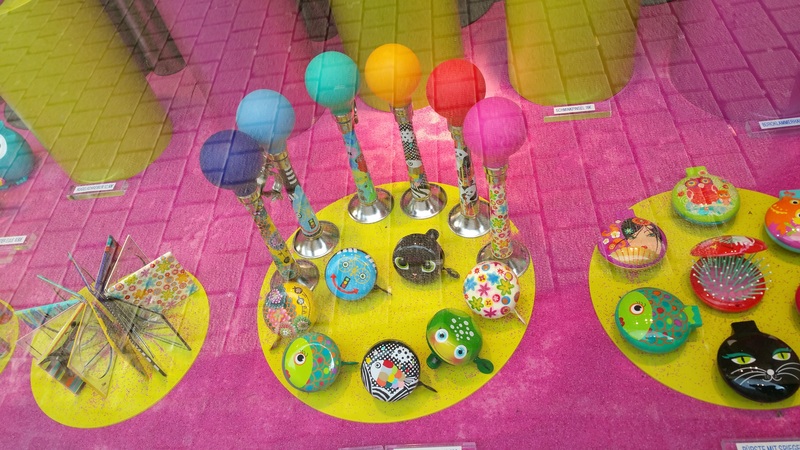 Bike bells are required by law in Germany, for riders of any age. 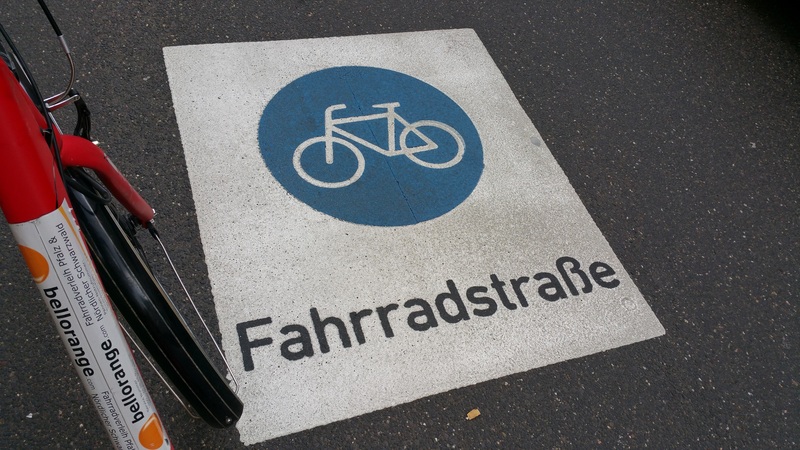 Public bike lanes are well marked in Karlsruhe and Southwest Germany cities. 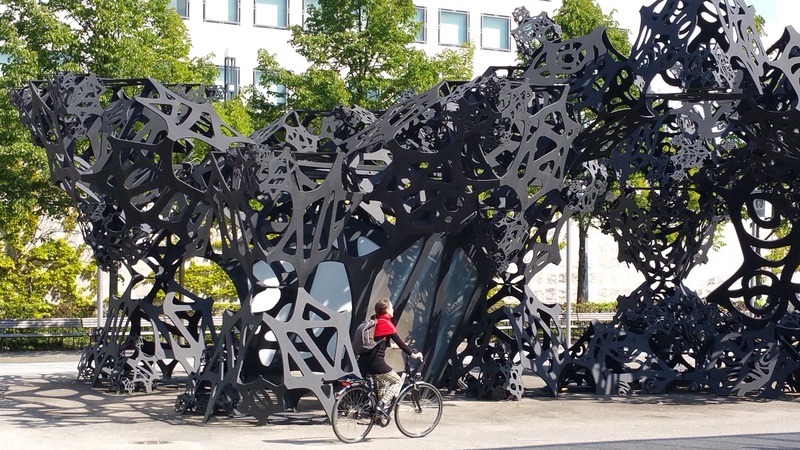 There are many good bike paths around the ZKM Center in Karlsruhe. A Laufmaschine, the first "bicycle," on display in Mannheim's TECHNOSEUM. 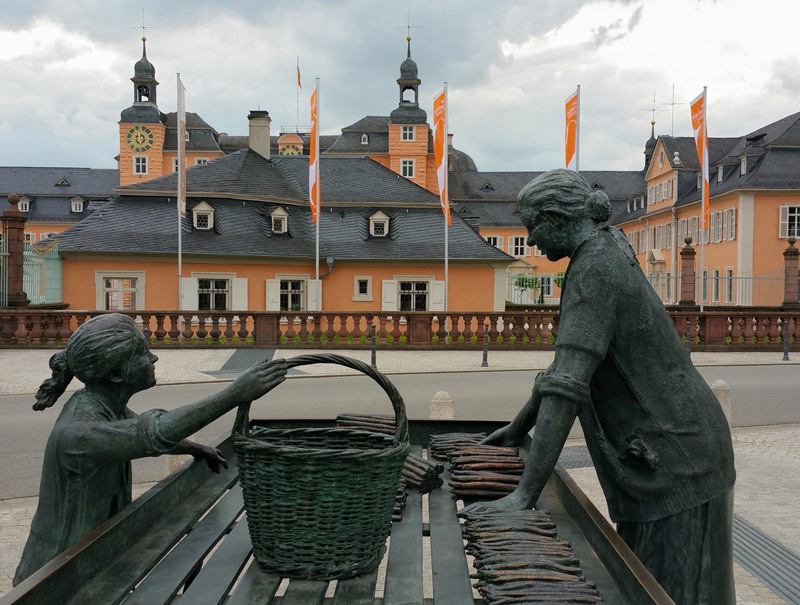 In Schwetzingen, the public art features an Asparagus Vendor. Germany’s passion for cycling was born 200 years ago in the State of Baden-Württemberg when nobleman Karl Freiherr von Drais invented the bicycle. Blazing the world’s first bike route from Mannheim to Schwetzingen on June 12, 1817, von Drais journeyed round trip 8.6 miles on his two-wheeled Laufmaschine (“Running Machine” in German). Like modern bicycles, von Drais’ design had an aligned front and rear wheel connected by a frame with a seat. He straddled the frame while propelling himself forward with his feet on the ground and lifting them to ride (pedals, gears and brakes were added later). Located on a wedge of land at the confluence of the Rhine and Neckar Rivers, Mannheim has enjoyed since its founding in 1607 a reputation as an inventive, ingenious city where creative ideas flow and intersect like its surrounding waterways. Mannheim was originally laid out in a chessboard pattern, earning its name “The City of Squares.” Navigating the old city center is simple because it is divided into 144 squares named by sequential letter-number combinations, such as A1, A2, etc. This makes biking Mannheim a fun, cartographic history lesson for kids. Major historic and cultural sites are all within a two-mile radius of the old city center and the 1889 Wasserturm (water tower) in Friedrichsplatz, a good central point for starting assorted city bike rides on the streets’ clearly designated bike lanes. Germany’s VRNnextbike program provides bike rental kiosks at Mannheim’s train station. Reserve up to four bikes in advance online for 9€ a day, 1€ per half hour. Bikes can be picked up at one VRNnextbike city and returned in another of the network’s participating cities. Leonardo Royal Hotel is conveniently located near Mannheim’s train station and water tower, as is cafe Dolceamaro, the new Raddisson Blu Hotel and the Oststadt neighborhood of preserved mansions that survived World War II bombing raids. Near the Planetarium Mannheim, the interactive TECHNOSEUM showcases Germany’s technological, engineering and scientific achievements from the 17th century to the present. While signage is written in German, good graphics explain exhibit content. Kids love the many hands-on experimental stations, scientific demonstrations and car and motorbike collections. 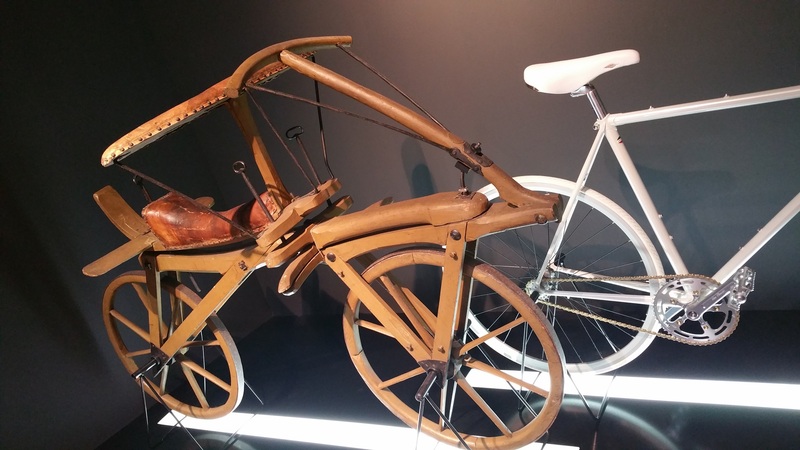 The TECHNOSEUM’s compact bicycle exhibit showcases a handcrafted, authentic replica of the von Drais Laufmaschine made of ash wood and iron (marketed as the “Draisine” design). The bicycle’s design evolution and how it changed the course of human transportation history are explained, including how von Drais’ invention inspired Karl Benz to invent in Mannheim the world’s first petrol-powered automobile. Whirring and clanking, 19th century textile looms, printing presses, agricultural equipment and paper production machinery delight German school groups. Plastics, bionics, nuclear and technological exhibits delve into modern scientific developments. The museum restaurant, adjacent to an operational steam locamotive, replicates an Industrial Revolution-era workers’ dining hall. Kids burn off steam in Luisenpark, part botanic garden and setting for Europe’s largest Chinese garden teahouse, playgrounds, lake gondolas, outdoor theater, butterfly exhibit, aquarium and tropical jungle house. The park is adjacent to the easy, peaceful Neckar River bike path. The Electoral Palatinate’s Baroque Palace, the second largest palace in Europe (Versailles is the biggest) was rebuilt after World War II to its original 18th century grandeur. While portions of the palace house University of Mannheim facilities, visitors tour the recreated staterooms, dress up period in costumes and learn court dances. Nearby is the reconstructed 18th century, Baroque Style Jesuitenkirche. Family-friendly Eichbaum Brauhaus serves traditional German dishes and beers (kids love the fruit-flavored lemonades). The numerous Turkish bakeries and farm-fresh market held year-round in Marktplatz provide tasty picnic fare and bike riding snacks. A perfect post-bike ride treat is “spaghetti ice cream.” Family-owned ice cream parlor and sweet shop Eis Fontanella has made the vanilla gelato noodles covered in strawberry sauce sprinkled with shaved coconut since 1933. It’s a 10-minute train ride from Mannheim to Schwetzingen. If biking to Schwetzingen, hire a guide because directional bike path signage is sparse. Germany’s BETT+BIKE program recommends overnight lodgings for bicycling travelers, or you can visit for the day. The orange sherbet-colored Baroque palace Schloss Schwetzingen (Schwetzingen Palace) reached its height of splendor and cultural expression under pleasure-seeking Palatine Prince Elector Karl Theodor (1724-1799). Like royals once did, visitors stroll the palace’s exquisite 178-acres encompassing English Gardens and the Turkish Garden featuring Europe’s last remaining 18th century garden mosque. In the surrounding dense forest, the court hunted wild boars and stags, a sporting tradition commemorated by some of the more than 100 sculptures. The lush grotto’s Temple of Apollo Theatre is the only open-air theater from this period left in Europe. Seven-year old Wolfgang Amadeus Mozart performed at the palace with the prestigious Mannheim School of Music. Visitors join guided tours of the palace’s ornate Rococo Theatre (the first in Europe with galleries) and Elector Karl Theodor’s marble and semi-precious stone-encrusted summer Bath House. The original, 18th century outdoor aviary dispays exotic birds. It’s easy to imagine court families performing marrionette shows at the original, tuft stone stage backed by the preserved Palatine landscape painting. The orangery’s palladian windows frame garden views for those dining at the family-owned Schlossrestaurant Schwetzingen. Michelin star Chef Michael Lacher serves German specialties, excellent wines and seasonal fare, including Schwetzingen’s famous, sweet springtime asparagus. The Neckar Valley Cycle Route’s trail connects Mannheim to Heidelberg, as do trains. While the bicycle route from Mannheim to Schwetzingen, and then on to Heidelberg is scenic, the day’s ride is close to 20 miles total and best undertaken with a local guide. There are VRNnextbike rental services in Heidelberg. 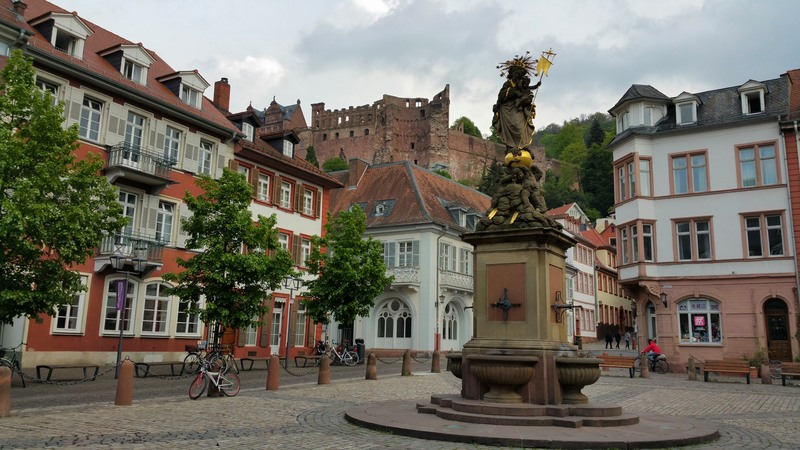 The ruins of Schloss Heidelberg (Heidelberg Castle) set in the forested Neckar River valley and the Old Town’s medieval, cobblestone streets are storybook settings. In 1693 during the Palatine War of Succession, the Prince Electors’ castle complex was destroyed. Its ruins became synonymous with the German Romantic Period, and has been a tourist attraction ever since. A speedy funicularclimbs to the castle. The Old Town’s numerous churches and pastel colored buildings span centuries of architectural styles. Family-owned Café Knösel has sold since 1863 Student’s Kisses chocolates, tokens of affection passed between Heidelberg University students. Founded in 1386, prestigious Heidelberg University welcomes visitors to explore its museum, the Great Hall and unusual Studentenkarzer (Students’ Prison). Rambunctious students documented their stays in colorful graffiti and silhouettes painted on the cells’ walls, some doodles dating from the late 18th century up to 1914. The pink sandstone, university library displays illustrated, medieval manuscripts telling tales of love and gallantry. A favorite Heidelberg University hangout since 1703 is Zum Roten Ochsen (Red Ox Inn). From 1893, six generations of the Spengel family have run the lively establishment serving hearty, traditional German food such as sausages and spaetzle. Patrons dine on graffiti-carved tables amidst fraternity drinking horns dangling from the beamed ceiling, cabinets of crest-insignia beer steins and paintings, photographs and sketches depicting Heidelberg scenes, student life and famous patrons. Join local families at the zoo and riverside water park. Rent pedal boats and take a 50-minute, guided river boat cruise (tours available in English) aboard the world’s largest solar-powered catamaran “Neckarsonne.” Across the Neckar River, is the wooded Philosophers’ Walk. Through centuries, reportedly many scholars, artists, musicians and writers (including Mark Twain) trod the zigzag path seeking creative inspiration while gazing upon the castle ruins. Today’s travelers seeking rejuvenating privacy, comfortable luxury, fine cuisine and pampering personal service stay at Der Europäischer Hof Heidelberg. Since 1865, the five star hotel has been owned and operated by the Gabler family and their grandson Ernst-Friedrich von Kretschmann’s family. Both bicycle inventor von Drais and car inventor Benz were born in Karlsruhe, ranked by the German Cycle Association as Germany’s second most bike friendly city (the first is Münster). In 1715, city planners created 32 wide boulevards fanning out from the lemon yellow-colored Schloss Karlsruhe (Karlsruhe Palace). Once the the Prince Elector of Baden’s residence and government seat, the Baroque Style palace is now the Baden State Museum. Visitors climb up the domed tower for a view of the symmetrical road system and the palace’s English landscape gardens where bicyclists pedal the wide paths and children ride a mini train. One of Karlesruhe’s popular family biking routes traces the quiet, scenic banks of the Alb River. The trail branches off to the ZKM Center for Art and Media housed in a restored former weapons and munitions factory. Composed of the Media Museum and Museum of Contemporary Art, ZKM’s sprawling creative complex preserves traditional to new art genres ranging from paintings, film, and music to digital computer and app art. There are frequent, guided family tours, youth-oriented exhibits and workshops. Chef Jörg Hammer’s and his wife Diana’s historic restaurant Oberländer Weinstube is tucked into an 1826 townhouse. The paneled dining room’s antique glass fixtures depict jovial tavern scenes. Patrons dine on artfully plated dishes of locally sourced meats, fish, farm-fresh vegetables and house-made ice creams. Hotel Eden, across from the zoo and within walking distance of the train station, is a BETT+BIKE certified lodging. While Karlsruhe is known for its bike friendly features, city cycling can be tricky because of the interurban train tracks embedded in many streets (a bike wheel can dip into the pavement’s rail line groove). Biking commuters expect sightseers to stay to the right. SouthWest Germany’s State of Baden-Württemberg promises families two-wheeling vacation memories they’ll never forget, just like how to ride a bike. For this multi-city trip, plan a week to 10 days. Itinerary options are spending two nights in Mannheim; possibly an overnight in Schwezingen (or make it a day trip from Mannheim); two nights in Heidelberg; a night or two in Karlsruhe (or make it a daytrip from Mannheim or Heidelberg). Trains travel frequently between these cities, most offering VRNnextbike rental. Children ages 10 and older will be comfortable biking on most city side streets and along the designated riverside trails. Families with teens and older children can bike city to city routes, however hiring a guide is recommended. City tourism offices can help arrange for local bike rental and bicycle tour guides. Bring your own bike helmets or rent them from bike tour companies. Bike locks and bells are provided. For more information on bicycling in SouthWest Germany, visit the Baden-Wurtemberg region website. Bike tour companies in SouthWest Germany include BikeTours.com, Radissimo.de and BellOrange.com.